Agnihotra is a simple healing fire from the ancient science of Ayurveda. Agnihotra is a process of purifying the atmosphere through a specially prepared fire. Agnihotra is the basic HOMA for all HOMA fire practices given in the ancient Vedic sciences of bioenergy, psychotherapy, medicine, agriculture, biogenetics, climate engineering and interplanetary communication. A copper pyramid of fixed size is used in the process of Agnihotra healing fire. Copper and gold are the only metals prescribed for the pyramid container used for Agnihotra fire. It is common knowledge of all ancient traditions all over the planet that copper and gold have healing properties. According to science of HOMA Therapy there is only a slight difference between the healing properties of gold and copper when used as pyramid containers for preparing Agnihotra fire. Agnihotra is tuned to the biorhythm corresponding to sunrise/sunset. You can practice Agnihotra in your apartment, garden, office or car. It takes only a few minutes of your time daily. Made of pure copper these truncated pyramids are essential to the performance of Agnihotra. Why copper? According to the Vedas, copper and gold have special healing properties. These metals also have special conductive properties. It is best to keep objects made of other metals away from your Agnihotra pyramid once it is in use, as they may detract slightly from the effects of Agnihotra. Kund, Samples of ingredients, and an Instruction Sheet. 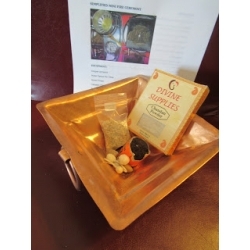 I also offer "Fire Ceremony Instruction Package - As Taught By Shri Haidakhan Babaji At Herakhan" should you desire even more than the mini kit offers.